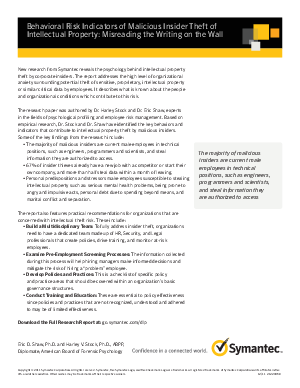 New research from Symantec reveals the psychology behind intellectual property theft by corporate insiders. The report addresses the high level of organizational anxiety surrounding potential theft of sensitive, proprietary, intellectual property or similar critical data by employees. It describes what is known about the people and organizational conditions which contribute to this risk. The research paper was authored by Dr. Harley Stock and Dr. Eric Shaw, experts in the fields of psychological profiling and employee risk management. Based on empirical research, Dr. Stock and Dr.Shaw have identified the key behaviors and indicators that contribute to intellectual property theft by malicious insiders. The report also features practical recommendations for organizations that are concerned with intellectual theft risk.